31.05.2015 (Hvino News). Georgian Ex-President Mikhail Saakashvili, appointed today as governor of Ukraine's Odessa region, compared Odessa city to Georgian wine. "Odessa is like a good Georgian wine, not everyone can understand it. But if you're lucky enough to do it, you will not be able to live without it, "- Saakashvili wrote in his Twitter. Odessa has Ukraine's largest seaport. A predominantly Russian-speaking city on the Black Sea, it has long been a reputed hub for corruption and organized crime. Mikhail Saakashvili has a reputation of effective fighter against corruption in his country. “We will bring new order and discipline to the country, and these are tasks that I put before the newly appointed Odessa governor,” Ukrainian President Petro Poroshenko said. 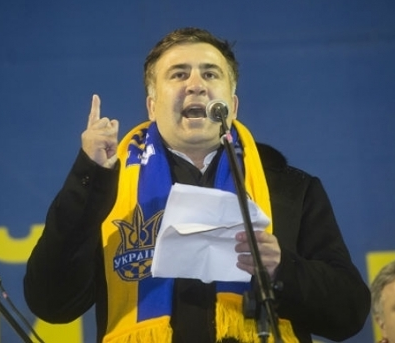 He granted Mr. Saakashvili Ukrainian citizenship before his appointment, though the Georgian gave his speech in Odessa in Russian. Under Saakashvili, Georgia fought a short war with Russia in 2008. He faces accusation of abuse of power at home, and Ukraine last month rejected Georgia's request for his extradition. 31.05.2015. At Anfora in the West Village, a server pours a wine with a distinct orange glint, like the last rays of a summer sunset. In a certain light, it could be mistaken for an easy drinking, easily forgettable rosé — until you have a sip. This wine, called Coenobium “Ruscum,” is made at a nunnery in Lazio, Italy, and its intense aromas and tastes run to dried pears, sage and hazelnuts. In place of a rosé’s cheery gulpability, this sipper verges on austere, with a bit of tannin that nips at your gums, as if it were a red. But Coenobium (Latin for “convent”) is an orange wine, an ancient style from the republic of Georgia that’s come into vogue in modern wine circles. “This category may be the oldest, but it’s also the newest category in the Western world,” says Joe Campanale, wine director for Anfora. While rosés are made with red wine grapes whose skin is removed early in the process, leaving just a hint of color, oranges are made in the opposite style. They come from white wine grapes that are left to macerate with their skins on, instead of separating the pressed juices from the skins to preserve clarity and avoid tannins. The result is a pour with a unique amber hue, tannins that grip your mouth, and flavors and aromas that range from musk to mushrooms to orange Creamsicle. 30.05.2015 (Hvino News). The 8th International Wine and Spirits Fair - WinExpo Georgia 2015 - will be held on June 5 - 7 June in Tbilisi. WinExpo Georgia 15 is the only international wine and spirits fair in Georgia and in the whole South Caucasus region, presenting full range of wine industry, products and services. 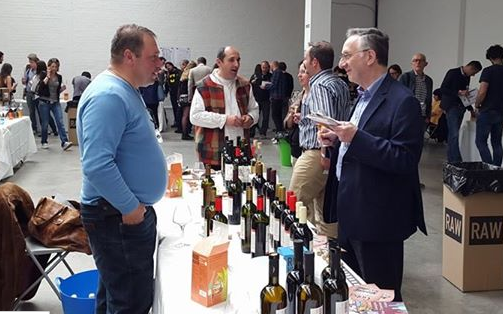 According to organizers' press release, it presents unique opportunities for producers and exporters to build success in this region, as "it creates profitable climate for blending of western and traditional Georgian practices in winemaking". The exhibition will bring together over 100 companies from Georgia, Germany, Ukraine, Moldova, Portugal and Italy. Visitors will get acquainted with the best samples of Georgian wine, cheese produced by traditional Georgian technology, and other unique products. A special section will be dedicated to wine tourism. Among exhibition participants there will be not only major wine companies, but small family cellars as well. On 5-6 of June, under the patronage of the International Organization of Wine (OIV), there will be held the 7th International Wine Competition. The award ceremony will take place on June 7. 29.05.2015 (Hvino News). 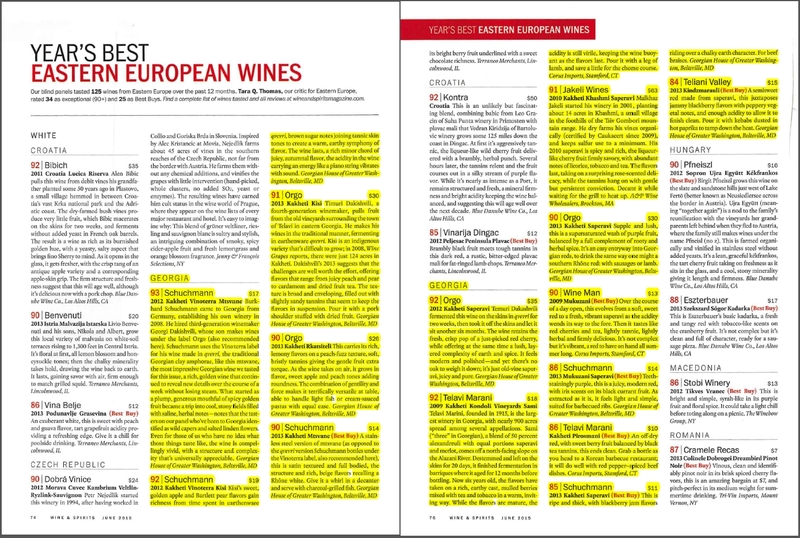 In its annual wine tasting, Wine & Spirits - one of wine industry's leading magazines published in USA - has included a record-braking number of Georgian wines. 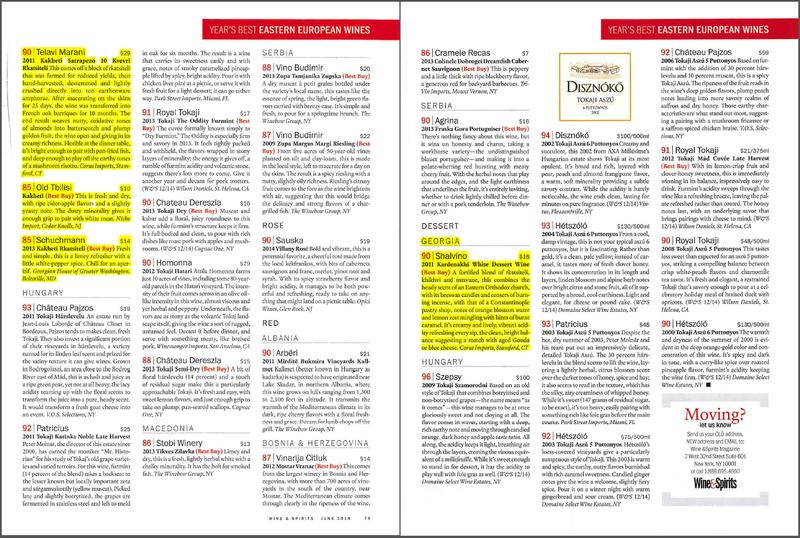 While in previous years not more than 1-2 Georgian wines reached W&S pages, the 2015's Year's Best East European Wines features 18 wines from Georgia. The highest rating (93) was reached by Vinoterra Mtsvane 2012 by Schuchmann Wines. Other wine producers featured in the tasting include Orgo, Telavi Marani, Jakeli, Wine Man, Teliani Valley, Shalvino, GWS Old Tbilisi. 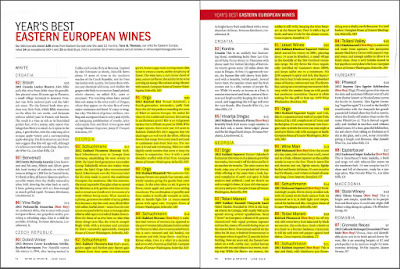 All Georgian wines are marked in yellow in the scans (click to enlarge pictures). Lisa Granik, Master of Wine, helped to present Georgian wines to the New York-based jury of Wine & Spirits. 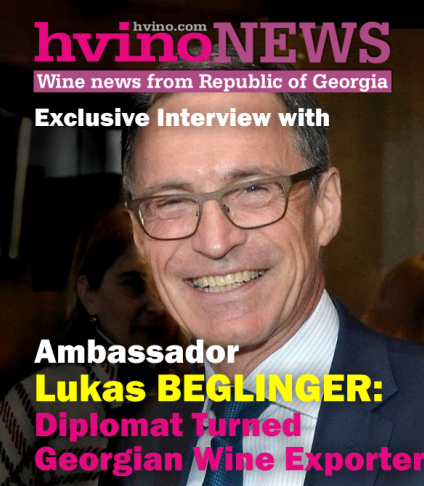 "My own involvement here was ensuring that as many [Georgian] wines as possible were represented - they only review wines that are available on the US market; I also helped put the wines in the appropriate categories, since the staff was unfamiliar with which wines might be semi-sweet, or qvevri-produced, etc. ", - explained Ms. Granik to Hvino News. 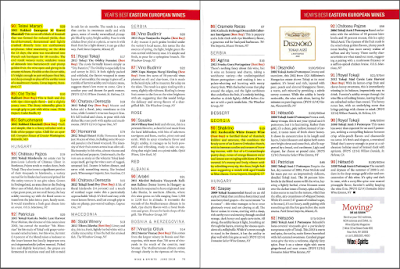 She pointed out that Wine & Spirits has become an increasingly important wine magazine in the United States. Founded in 1982, Wine & Spirits is published eight times a year and read by over 200,000 members of wine community. 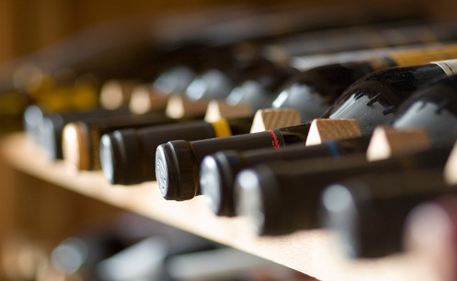 Wine & Spirits evaluates more than 13,000 bottlings every year. 29.05.2015. Ancient remains of a temple and a cellar dating back to the 1st millennium BC have been discovered in Georgia’s capital city. An archaeological team from the Georgian National Museum uncovered the 2,000-year-old remains of a temple and a cellar of the Iberian Kingdom at the Treligorebi settlement on the top of a hill in Tbilisi. The scientists believed the cellar was most likely part of the temple complex, which was found through aerial photography and Google Earth satellite images. Currently archeologists are trying to validate their find by conducting trial excavations at the site. 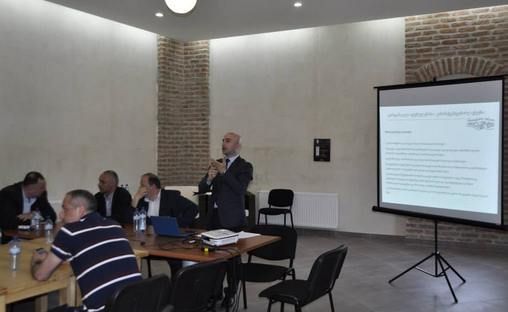 A representative of the National Museum said this discovery was extremely important in terms of studying and reconstructing the history of the development of Georgian qvevri winemaking process. 27.05.2015. History would advise against crossing a powerful Russian politician. The tiny country of Georgia learned this lesson nearly a decade ago when a spat between then president Mikheil Saakashvili and Russian president Vladimir Putin resulted in a political jab which hurt Georgia in the short-term, but proved to be a significant boost in the long-run. Faced with the loss of its top export market – 80 to 90 percent, Holm said – Georgia and Moldova, who also faced Putin’s wrath, had to refocus their export efforts. They set their sights on the United States and Europe, shunning the superpower which had shunned them. 27.05.2015. On May 22, National Wine Agency introduced the prepared amendments to the Law of Georgia on Vine and Wine to the Parliamentary Committee on Agrarian issues. Deputy Minister of Agriculture, David Galegashvili, the representatives of Kakheti regional administration, Association “Georgian wine” and wine producing companies also attended the meeting. 24.05.2015. 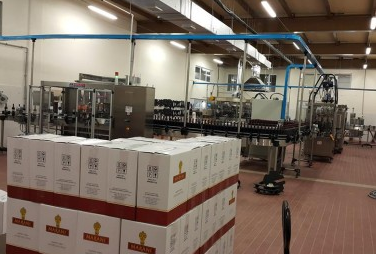 JSC Telavi Wine Cellar [known under Marani brand name - HN], the company with delicately paired modern technology and time-proved traditions, has reached the point when it is equipped with latest technologies and particularly the production line of finished goods. This production line was designed and assembled in Italy as a result of cooperation between leading wine equipment manufacturers and the founders of Telavi Wine Cellar. It took more than a year to build the equipment. The production line provides an automatic procedure for each of the wine bottling operation with the maximum result of six thousand bottles per hour. This is a unique bottling line, which is currently the only one in the Caucasus. 23.05.2015. Archaeologists are hard at work sifting through the dirt at a dig in Imiri, south-eastern Georgia. 22.05.2015 (Hvino News). 16 Georgian wines have received awards of International Wine Challenge (IWC), including 4 silver awards. The results of annual IWC competition were announced recently in London. Georgia's overall performance in 2015 was average, comparable to results of 2013 and 2012, when Georgia won 15 and 12 IWC awards respectively, and no gold awards. But in 2014 Georgia achieved huge success with 32 awards including gold (see more detail here). 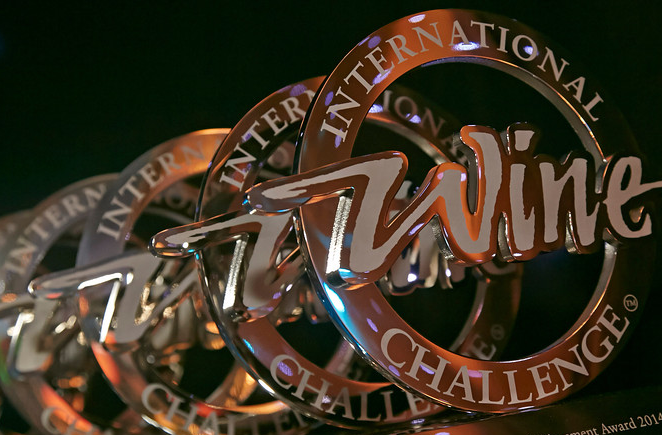 Called "the most comprehensive and influential blind wine tasting competition in the world", the International Wine Challenge (IWC) is owned by William Reed Business Media, and is now in its 32nd year. Throughout the rigorous judging processes, each medal-winning wine is tasted on three separate occasions by at least 10 different judges and awards include medals (Trophy, Gold, Silver, Bronze) and Commended and Great Value awards. 22.05.2015. A thorny international skirmish between Russia and its former Soviet states has been a boon for Georgian wine-makers. A man with high cheekbones and deep-set eyes waves toward our car from among the grapevines. It’s mid-October and the grapes have all been picked, but drying leaves rustle like flags in the breeze. I’m at Iago Bitarishvili’s winery in Chardakhi, Georgia. This former Soviet country is, legend has it, the birthplace of wine. People have been fermenting grapes here for several millennia longer than anyone in Western Europe. Many families still make their own wine at home, bottling it in plastic jugs for communal consumption at weddings, funerals and feasts. 22.05.2015 (Hvino News). Intellectual Property Agency of Armenia has granted titles of protection for six appellations of origin of Georgian wines. Georgia's National Wine Agency was granted an exclusive right on appellations Tsinandali, Akhasheni, Kindzmarauli, Khvanchkara, Manavi, Mukuzani in the territory of Armenia. 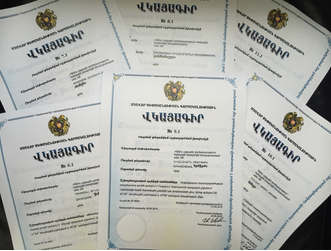 Sakpatenti (National Intellectual Property Center of Georgia) has filed applications with the Intellectual Property Agency of the Republic of Armenia a year ago, which were successfully registered after the completion of internal procedures. Sakpatenti notes in official release that protection of appellations of origin will further prevent counterfeiting and unlawful use of the appellations of origin of Georgian wines in Armenia. 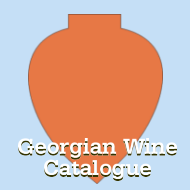 Georgia has been actively working to protect its original wine appellation names from unlawful use in several countries, in particular USA and Germany. 20.05.2015. Wine geeks are sometimes told to lighten-up. Wine is “just a drink”; “just a grocery”. When it comes to serving whites at 42 °F versus 47 °F [5 °C and 8 °C respectively - HN], matching wines to specific glasses and pairing Assyrtiko rather than Sauvignon Blanc with crudo, I agree. However, I suggest you don’t tell a Georgian to chill about wine. In this dramatically rugged Caucasus Mountains country, wine is holy. And not just the communion wine. Wine is part of the Georgians’ sacred trinity, along with the motherland and the mother language. It is so holy, I feared expectorating (or as lightened-up folk say, spitting) at a wine-producing monastery. When I persisted in doing so later on my eight-day trek through eastern Georgia’s Kakheti region, I received some disapproving looks. While all wine is revered, those made in qvevri (pronounced kwev-ri) are the most precious. Qvevri are fired clay vessels lined with beeswax that look like super-sized amphora. They are easily 1,000 liters large and are buried in the earth for fermenting and aging wine. 19.05.2015 (Hvino News). Georgian wines were presented at the RAW, the artisan wine fair in London on May 17 - 18. The Georgian winemakers are traditionally well-represented at RAW. While Nika Bakhia, Beka Gotsadze, and Naotrebi brought their wines to RAW in person, 14 more wines from other small producers were delivered to the fair by Georgia's National Wine Agency. Those wines were grouped together on Georgia's "Multi-Grower Selection" table (wines by Petriaant Marani, Jakeli, Teleda, Temi, Satsnakheli, Twins Wine Cellar). Featuring around 150 growers, RAW wine section is one of the most exciting collections of fine, organic and biodynamic wine artisans. According to RAW's release "their wines are pure, kind to the planet, very possibly better for your health and best of all they're absolutely delicious". 17.05.2015. In 2015, exporters of Georgian wine will place particular emphasis on strengthening their presence in five countries - first and foremost they are China, Great Britain, USA, Poland, Japan. According to Director of the National Wine Agency George Samanishvili, diversification of supplies will enable Georgia to reduce its dependence on a specific region, and in the long term to find an alternative to the Russian market. "In addition to China, we have chosen a number of priority countries. Private companies also took part in their selection, as their opinion is very important. We chose five countries such as China, Poland, the USA, Great Britain and Japan. These are countries where there is the prospect of growing sales,"- he says. According to him, concrete results are already evident. "Our markets are much more diversified than it was in previous years. We hope that progress in this direction will be continued. Now the share of traditional markets in the post-Soviet space in total exports has reduced and the share of other countries is growing, "- George Samanishvili notes. 15.05.2015 (Hvino News). 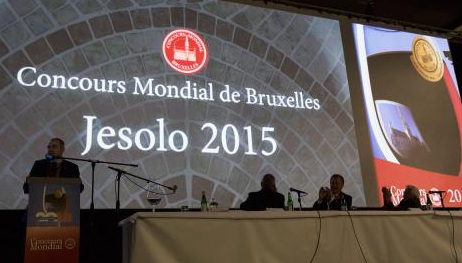 The results of the 2015 Concours Mondial de Bruxelles (CMB) have been released recently. The competition took place at the Italian sea resort of Jesolo on May 1-3. Over 8,000 wines from 45 producer countries competed before a selection of the world’s foremost tasters. 299 wine tasters representing 49 nationalities gathered for 3 days to judge entries. At the end of the competition, only those wines that have achieved the highest scores are eligible for the prestigious medals. 15.05.2015 (Hvino News). Chateau Mukhrani was the only Georgian wine brand presented among the world’s 50 best wines during a prestigious fund-raising event The Triumph of The Wine Culture, held at the United Nations offices in New York, on April 30, 2015. 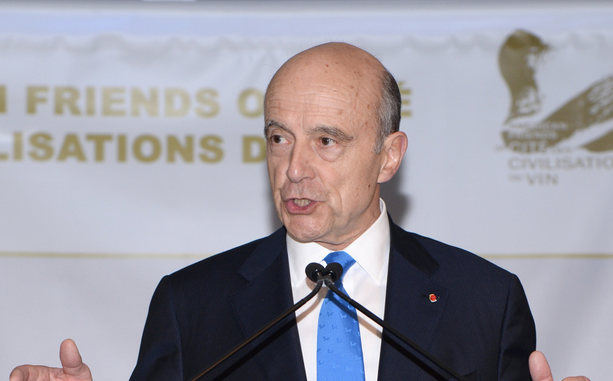 Organized by American Friends of Cité des Civilisations du Vin, the event was opened by French former prime minister Alain Juppé, mayor of Bordeaux. The event featured wines from over 50 countries, food prepared by some of New York’s finest chefs, musical entertainment. The wine and food extravaganza was held at the Delegates Dining Room at the United Nations. 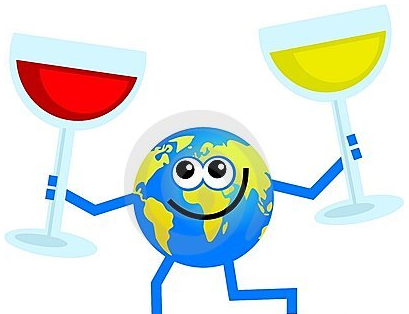 The best wines from more than 50 countries was available during an “around the world” wine tasting and food pairing. Cité des civilisations du vin is an exciting international center dedicated to wines and civilizations in Bordeaux. It is the only museum in the world dedicated to wine civilisation as a universal, cultural, symbolic phenomenon. This is the world’s largest cultural centre dedicated to the universal, living heritage of wine: around the world, throughout the ages, across countless cultures and civilisation for visitors to discover. The ministers of agriculture of the two countries signed a joint action plan for cooperation in the agrarian sector. 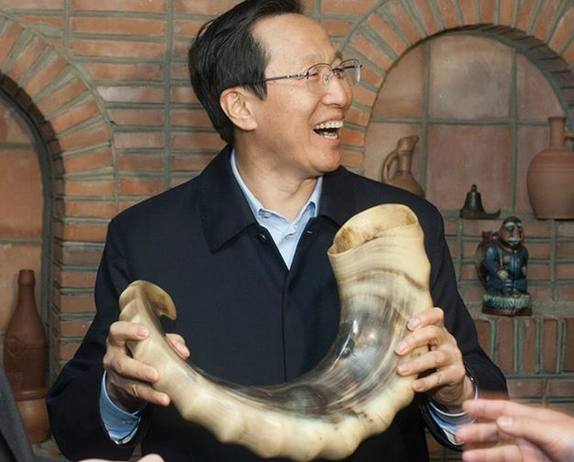 On the first day of his visit on May 10, the Chinese Agriculture Minister visited some of the Georgian wineries in eastern region of Kakheti, including Badagoni and Winery Khareba. "Georgian wine has a huge potential to establish itself not only in the Chinese but the world market. At the same time it is very important to support tea culture. We want to share our experience in this direction, which will be very useful for Georgia,” Changfu said. 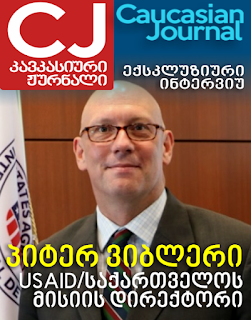 Georgia has already developed a strategy and Action Plan for developing the agricultural industry, and this was "a guarantee for great success in this sector,” he added. China is fifth largest export market for Georgian wine. 494,478 bottles of Georgian wine were exported to China in the first four months of 2015, which is 87% increase over the same period of last year. 12.05.2015. Georgia is probably the oldest wine country in the world. Grape seeds found there suggest that wine was first produced there 8,000 years ago. But tradition did not protect from the turbulences the region has experienced during the past decades. Now Hilarius Pütz, who was born in the Moselle region, is to promote viticulture in this country located in Eastern Europe. Since 1985, times have been hard enough in Georgia. At that time Georgia belonged to the Soviet Union and cultivated over 100,000 hectares of vineyards. But then head of government Gorbachev wanted to fight alcoholism in the Soviet Union, so he also targeted viticulture. By then Georgian wine had almost had cult status in Moscow and other Soviet metropolises. But due to the restrictions many vineyards had to be given up. Then the Soviet Union broke apart. In 1991, Georgia became independent but first it experienced a civil war, and in 2002 an earthquake. 06.05.2015. In January-April 2015 the export of Georgian wine to 26 countries has decreased in comparison with the same period in 2014 by 58% and amounted to 7.9 million bottles. The decline in exports is still associated with the economic crisis in two major countries importing Georgian wine – Russia (decline in exports by 76%) and Ukraine (57%). At the same time, exports increased to countries such as China (+ 87%), Belarus (27%), Japan (9), Canada (250), Britain (+ 79%), Estonia (+ 16%), Poland (+ 7%), Germany (+ 6%) and the USA (+ 6%). According to the National Wine Agency, April was more active in terms of exports than the first three months of 2015. In particular, in January export made 1.3 million bottles, in February – 1.5 million, in March – 2, 1 million, and in April – 2.8 million bottles. “According to the forecasts of winemakers, in May export growth is expected as the national currency has begun to stabilize in Russia, respectively, the situation in the country is more or less stabilized”, - points out the National Wine Agency. Despite significant reduction, Russia remains the main importer of Georgian wine – in January-April exports to that country amounted to 3.2 million bottles. Followed by Kazakhstan – 1, 5 million, Ukraine – 873 516, Poland – 519 576 and China – 494 478 bottles. In January-April 2015 the export of Georgian wine amounted to 23, 4 million bottles. 05.05.2015 (Hvino News). “Unless the wine is good no branding can really help you”, - says Kate Gersamia, owner of the boutique Lukasi Winery. Today Ms. Gersamia is the guest of Hvino News, and she kindly agreed to answer our questions. Since 2009 Lukasi has made a limited quantity of high-end premium quality wines. Annual output is limited to 10-12 thousand bottles. We consider ourselves to be a boutique winery producing only the best Georgian wine. Our most important achievements are the numerous international awards that Lukasi wines have won. 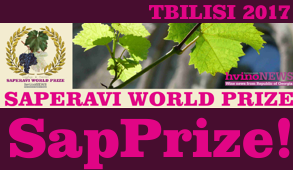 This we consider to be not only our company’s achievement but also a great achievement of Georgian wine, the latest being the Double Gold and Diamond trophy in Japan for a very unique Georgian wine made of Chkhaveri grapes [read more here]. This year we are also expecting to receive quiet a few awards, hopefully. We wish you much success, and will cover your achievements. Let's talk about the Lukasi brand. Are you creator of your brand? If yes, how was it made? 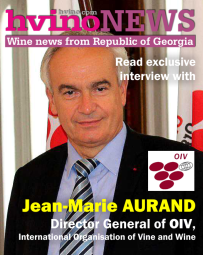 01.05.2015 (Hvino News) On 29th of April 2014 a selection of Georgian wines were presented in Paris at International Organization of Vine and Wine (OIV). 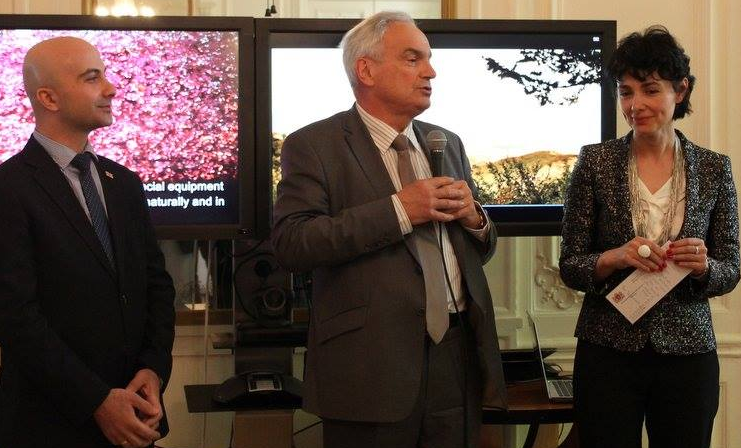 About 350 guests attended the wine-tasting event, including Georgian Ambassador to France HE Ms. Ekaterine Siradze-Delaunay, Director General of the OIV Mr. Jean-Marie Aurand, President of the National Wine Agency of Georgia Mr. Giorgi Samanishvili. 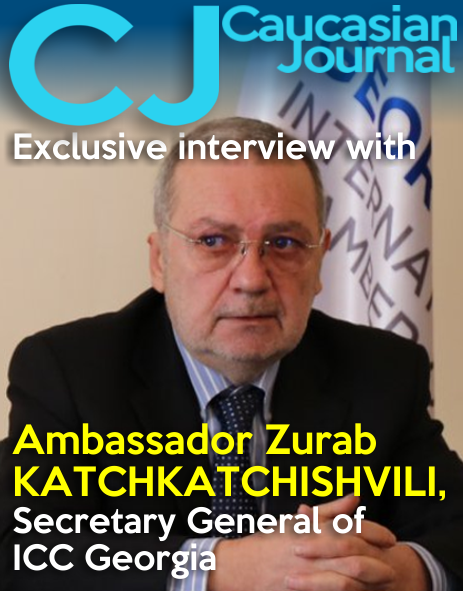 The Ambassador recalled that Georgia, the heart of the Caucasus, was one of the cradles of world viticulture. For millennia the vine are grown in ideal climatic and geological conditions. The oldest seed, collected in several points of the country dates back to at least eight thousand years BC. Now in Georgia 525 indigenous grape varieties are grown. The Director General of the OIV Mr. Jean-Marie Aurand welcomed the event and thanked Georgia for its strong involvement in OIV activities since the World Congress in Tbilisi in 2010. 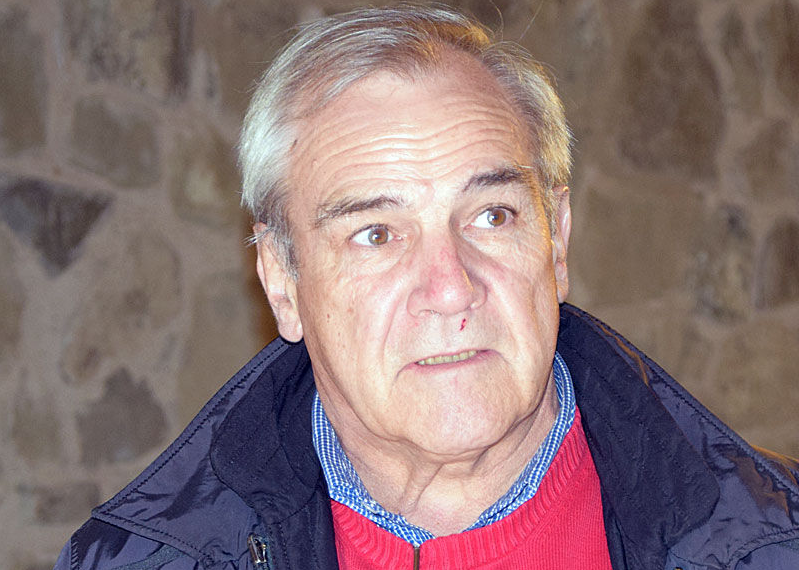 Mr. Aurand stressed the revival of Georgian wines. "Small wine producers, cooperatives and independent wineries are rivaling in quality", - stressed Mr. Aurand. 01.05.2015. Last spring I met Georgia's first female owned wine company and have had the privilege of following them for an entire year, from vineyard to qvevri, to bottling. In Georgia, men have traditionally been in control of the 8,000 year old qvevri wine making process, so these women, along with another young woman named Mariam Iosebidze who started her own wine company in 2014, are at the forefront of a change in culture and attitudes towards women in Georgia. I have interviewed these women and tasted their wine and I would like to share their stories over the next few months. 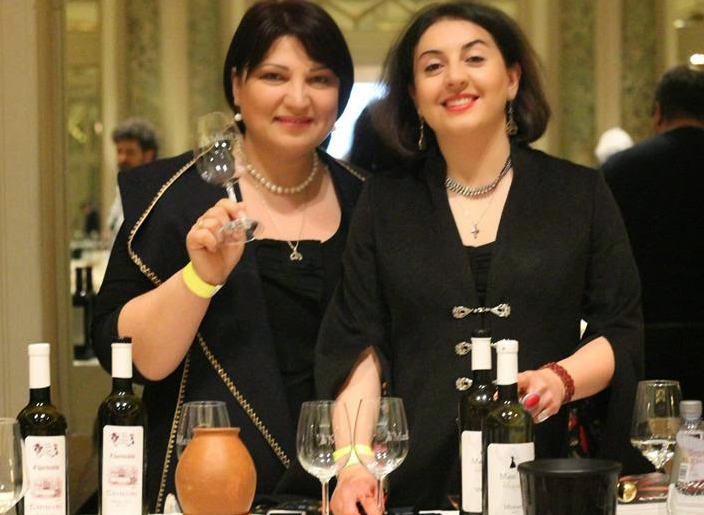 For now, a short introduction to the First Ladies of Georgian wine; Marina Kurtanidze and Tea Melanashvili of Mandili. To preface, Tea is my very good friend, she is simply someone I adore, and Marina is a dear friend as well who is a force to be reckoned with. Besides friendship, they have been a big part of my shift in thinking about how women in the west view women in other parts of the world. In short, we believe that we have it better and that those “other” women are not as liberated. Before I went to Georgia, I was told that it was an extremely sexist country where women were not treated well and that, in fact, I should avoid going there. So during my first trip, I made a few cultural faux pas having this attitude in the back of my head. I met Tea at Vino Underground, a wine bar in Tbilisi that focuses on natural wines, and learned that she was one of Georgia's first female wine makers. I was intrigued. How could it be possible in this country? We tasted her wine, and I was hooked. Not only was I impressed with Tea for making strides in the wine world, I was impressed with her wine, Mandili.